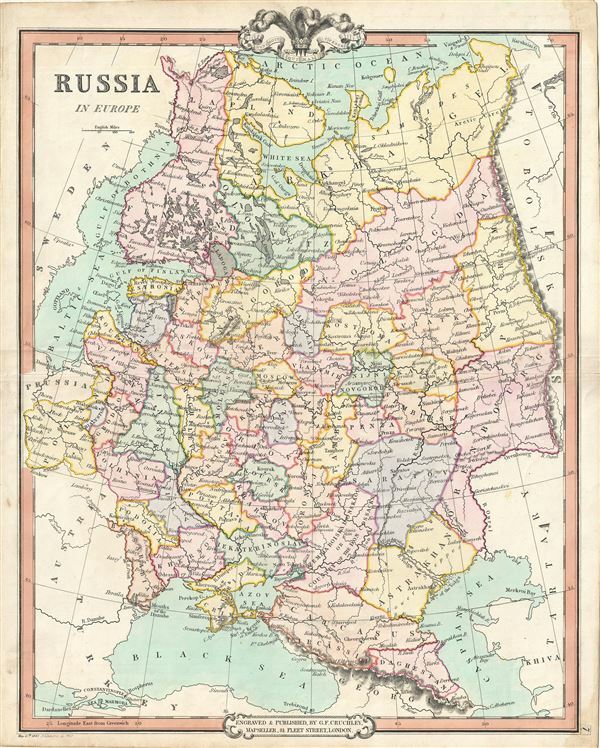 This is a lovely 1850 map of Russia by George Frederick Cruchley. It covers the European portions of Russia from the Gulf of Bothnia to the Ural Mountains and from the Arctic south as far as the Black Sea. The modern day nations of Russia, Ukraine, Belarus, Moldova, Poland, Lithuania, Latvia, Estonia and Finland are included. Russia at this time was under the suzerainty of Tzar Alexander the II. Alexander is best known for his liberal reforms including the emancipation Reform of 1861 which liberated Russia's countless serfs and is considered to be the most important event in 19th century Russian history. This map is color coded according the counties and provinces, showing important cities, towns, rivers, lakes, mountains and other important topographical features. Elevation is rendered by hachures.